Another one of wireless encryption techniques can be broken: WPA/TKIP. The other one, long considered insecure, is WEP. While the weakness of WPA/TKIP does not directly affect the majority of users, another vulnerability does: few wireless routers are properly secured with wireless encryption and strong passwords. Record the password, WPA pass phrase, and the SSID in at least two safe places. If the router is used in a business, add a "wireless settings" page to the network/server documentation and record the information there. These steps will easily close 99% of the router's attack surface: make it harder to find by strangers, virtually impossible to listen in to, or gain access to the administrative settings. Wireless routers are common attack targets for the simple reason that you don't have to have physical access to the device in order to probe its defenses. On top of it, most wireless routers are shipped in insecure and vulnerable configurations: easily guessable administrative passwords, easily discoverable, no encryption. Securing a wireless router is important not only to protect your sensitive data, but also to protect it against potential infection where your network and computers can be used to to launch attacks at others. There is really no foolproof 100% protection from user errors. Users are just too imaginative and sneaky. No matter how well their computers try to protect themselves against their owners, the owners find these inconceivably spectacular ways to lose their baby photos and tax records. Yes, tax records fall victim to more hard disk crashes than there are hard disks in existence, and the IRS is investigating this matter. The dogs are planning a class action suit, too. There actually is a way to protect against user error: frequent backups. Do it yourself with utter frequency and consistency. Also, backup to the cloud. The number two reason: hardware error, such as hard disk failure, or some sort of a crash that mangles or destroys your data. Here, there are two ways to protect yourself: automatic data redundancy and backups. The first option will not save you from user error; only from hardware errors and crashes - and even then - not always. The latter option is the only relatively foolproof to protect your data. Backup your data and backup often. Now that I am done with the Computer Consultant's Number One Mantra, I will concentrate on data redundancy in the form of RAID or Redundant Array of Independent Disks. This is going to be boring. The two most common desktop RAID levels are 0 and 1 where The Zero isn't redundant at all and I have no clue why it is still called "redundant" but it's a long running tradition and I like to follow traditions with the exception of popcorn at the movies. I neither understand nor follow this strange tradition of drowning the 24-speaker surround sound exquisitely crafted by Hollywood, with popcorn crunching right between your ears. You do? Write a comment. Backup your data and backup often. I warned you it was going to be boring. RAID level 1 puts each byte onto two drives simultaneously. Each byte is stored twice, so if one drive fails, there is still a copy on the other drive. The data is protected right up until one of the drives fails. Once it fails, and eventually, they all do, the data is not protected until the RAID1 set is rebuilt again, i.e. the failed drive is replaced with a new one, and the set is restored to the "healthy" status. Which means RAID1 not only takes two drives to protect one, it is also not a 100% protection against drive failure. (Repeat after me...) In the end, the cost of protection is 50% of the total capacity: in a RAID Level 1 set of two 1TB disks, the total usable capacity of 1TB is half of the total capacity of 2TB. With gigabytes and terabytes getting cheaper, lighter and physically smaller, it's not far-fetched to put 4 or 5 of them in a computer and try to protect them against a failure of one. Or two. Enter RAID levels 5 and 6: that's exactly what they do. Level 5 protects against a failure of a single hard disk in any RAID5 set, and Level 6 - against two. The cost of this protection is in a loss of a capacity of one or two disks, respectively. In other words, a RAID Level 5 set of five 1TB disks will have a usable capacity of 4TB, and a RAID Level 6 - 3TB. This is more efficient than RAID Level 1 as the usable capacity is more than 50%. There are also other RAID levels we will not touch in this article, as they are far less common than 0, 1, 5 and 6. That said, RAID Levels 5 and 6 put a much heavier load on individual hard disks compared to other levels, notably 0 and 1, and heavier duty (enterprise level) hard disks are recommended for these configurations. Individual hard disks in RAID5 and RAID6 arrays have two parts: data and parity. Each individual write operation to an array will consist of two resultant write operations to each hard disk: to its data portion, and to its parity portion. The potential performance penalty is significant and can range from 10-15% to 90%, depending on an application, drive and controller characteristics. While disk and controller caches often reduce the penalty and improve RAID5/6 write performance, the fact that each drive has to do a double duty for each write operation, still remains. It is thus recommended to use heavy duty hard drives with longer MTBF numbers, designed for enterprise applications, in RAID5 and RAID6 arrays, and their derivatives. Note: I am not including enterprise class hard drives with 10,000rpm or higher rotational speeds, or SSD models, because they are still quite a bit more expensive than their 7200rpm counterparts, and are usually cost-prohibitive for mainstream video editing applications. Quietly and without much fanfare, Hewlett Packard began offering liquid cooling on its Z-series workstations. 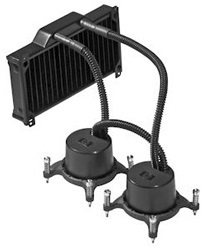 Liquid cooling kits have been around for years, usually as after-market options for overclockers. With HP offering it as a standard item, liquid cooling becomes less of "living on the edge" gaming affair, and more of a mainstream option, albeit for expensive top shelf models of their workstations. While there seem to be no pre-configured models with liquid cooling kits installed, the Z800 "configure your own model" page has two options under "Thermal Kit": "HP Air Cooling Solution [Add $1], and "HP Liquid Cooling Solution [Add $250]". The latter is only supported with "High Power" processors, Intel models W5580 (3.2GHz) and W5590 (3.33GHz). A brief trip to Google uncovered a great article on ComputerWorld that was just posted yesterday. Besides reducing power-sapping heat, liquid cooling serves another purpose that is critical for workstations: reducing fan noise. According to the article, the noise is cut down by 8 dB under heavy load (from 38 to 30 dB), and this is a big deal for those of us who don't enjoy monotonous and often annoying fan humming. Availability: HP usually ships "configure your own" models within 1-2 weeks. Under the hood, Z800 looks just like BMW M6 10-cyl 500hp GT cruiser: you can see the oil dipstick, everything else is shiny plastic and metal. To access slots, drives, memory and CPU, just lift off plastic panels: no tools required. The workstation can be taken apart and put back together in seconds with bare hands. Speaking of bare hands, the workstation now features case handles. Unboxing, boxing, and simply moving the rather heavy system (45 lbs net) suddenly became so much easier. Unlike IBM designs, Z800 has two handles, and unlike Mac Pros, the handles are cylindrical and will not cut your hands. Even the "high power" models (3.2GHz and up) are nearly silent. The fans kick up just a bit under full CPU load, yet it's quieter than xw8600 under load - and much, much faster. Up to six SAS or SATA 3.5" drives can be fit inside, 4 in pluggable drive cages, 2 more - in optical bays, using special "optical bay mounting kits". All installed without a single screw. My favorite configuration for a top-of-the line video editing system: 300GB 10K rpm SAS system drive, five 2TB 7200rpm SATA drives in RAID0 mode on the LSI controller, which gives a total of 10TB capacity and about 500MB/s transfer rates, enough for realtime uncompressed HD and 2K editing and previewing. Fast, quiet, stable, well designed, easily expandable and upgradeable - what more can one ask for? It's the best workstation HP has come up with. Eager to get one configured for video editing or visualization applications? See Z800 on DV411.